to feel like I've had long enough with you. This was the night he had been anxiously waiting for the whole week, ever since he asked Nicole out to dinner earlier this week. Danny got them a table in the Stratosphere Restaurant, high up in the tower. But first, before dinner, Danny took Nicole up to the platform with the most beautiful view over the city. It was sunset, and the last rays of sunlight bathed the city in red and orange light. It was a beautiful view, very magical and romantic, if you wanted it to be. Danny was wearing a casual outfit, white long-sleeved shirt, black dress pants and a matching sport jacket. No tie, as per usual, the first two buttons of his shirt undone. He had a surprise for Nicole tonight and it took every last bit of strength for Danny to stay calm and casual on the outside. Inside though, he felt very nervous. He had his hand in his pocket, his fingers curled around the small box that held his surprise for Nicole. Without even noticing, Danny had a soft smile tugged to his face as he led Nicole to a place on the platform that was actually pretty quiet. Perfect for his plan. Nicole looked around the place as she stood with Danny. She was dressed in a sundress that she found during a day out with Lexi. Her hair was down and she had on her black low heal shoes. She also had pantyhose over her legs as it was a bit cool outside. "This place is great Danny." she said to her. "How did you find it?" Nicole asked while glancing over to him. as she said that. It was clear that Nicole was impressed with the place. Danny gave Nicole a slightly questioning look. It was easy, the Stratosphere was the highest tower in the US, one of the city sights and he was actually surprised that she's never been up here, yet. Truth be told though, he had been up here only once during his many years in Las Vegas. But this place was just perfect. "Well, it is the highest tower in this country." Danny explained, keeping his tone casual. "And it's a city sight, one I've visited only once before." And back then, he had been up here on this platform all by himself, looking over the city. He remembered the view from up here and with the sunset bathing everingthing in red and orange colors, it was an impressive view. One that Danny actually enjoyed and it kept him calm right now, as he was waiting for the right moment. Nicole nodded a bit when Danny said that to her. "I see.....I've never been in this part of the city that often." she added gently, making up for her goof. "Its good as gold" she said to him after looking around again. Nicole had no idea what would take place this night and how her life would change for the better at the end of their time here. For now, Nicole took it all in as she stood there with Danny. Danny couldn't help but smile a little. He didn't mind, when someone asked a silly question, because he knew he did that, too. Sometimes. He gently put his arm around her, standing next o Nicole and taking in the view over the city. Although he's seen it once before, Danny was still impressed just how much it could pull you into a magical moment. However, the more time passed, the harder it was for him, to stay this calm and not let Nicole notice that he was up to something. But he was feeling so nervous, his heart was beating a little faster in his chest, waiting for the right moment. But what was that moment? All that Danny knew was that he wanted this to be special, unique even and he knew how he wanted to begin. His fingers curled around the small box in his pocket again, feeling the soft velvet on his skin. He couldn't wait to see her face. He didn't remember being this nervous when he proposed to Anna, though. This was a very different feeling. Nicole smiled when Danny put his arm around her, loving it when she did that to her. At the same time, she sensed that he seemed on edge about something. "Danny, you alright?" she asked while glancing over to him. "You seem jumper then a kangaroo." she added while looking at him. Nicole wondered what had him acting this way, but she drew a blank. Oh boy... he thought to himself, not sure how to get out of this one. Or if he even had to get out of it. Maybe this was the moment he was waiting for. And what better moment than when she already suspected that something was up? Although he wanted to take her by surprise, but he figured he would do that anyway, because he didn't actually talk to her about it. Maybe this is it, Danny... don't wait too long. "It never ceases to amaze me how you always know when something's up." he said in a soft, loving tone. He pulled the small box out of his pocket. "Well... I got you something." he finished, handing the small box to her, so she could open it. Nicole smiled a bit when Danny said that. "That comes with the training I've had." she replied gently before taking the box. "Danny you didn't have to get me....." she started to say while opening the box, only to stop when she saw what was inside. Nicole just stood there and looked at the ring, clearly surprised. Everything around Nicole came to a stop as she slowly looked back to Danny. Danny felt his heart beating fast against his chest, he was nervous and curious at the same time. It was a strange feeling, really hard to describe. 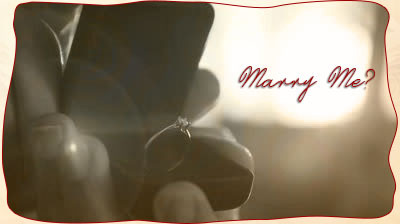 He watched Nicole opening the small box, revealing a beautiful, but modest ring that had picked out some time ago. He had it with him for a while, always waiting for the right moment. A couple of days ago, he decided this was going to be it. The day he'd get his courage together and do what he wanted to do for some time now. "Well I know a man who's brave and bold and strong as strong can be. He's handsome, with a head of gold, but sadly, he's not me. I know a man who's smart and wise and clever as can be. He's quick and witty, with dancing eyes- but sadly, he's not me. I know a man who's not so strong nor perfect as can be, but he loves a girl with all his heart- well shucks- that sounds like me. So though I'm not a perfect man I'm here, on bended knee. This question now my heart demands: Will you marry me?" Danny looked into her eyes the whole time as he said that poem, then, with his heart still beating fast, as if it would explode any moment now, he waited for her response. Nicole watched Danny as he said that poem to her, feeling tears fall across her cheeks as she heard those words. When Danny finished, Nicole watched him for a few moments before she finally spoke up. "Yes......yes Danny I will marry you" she said while everyone around them cheered. Nicole smiled even more when that happened. It was clear that she was happy. Danny didn't even noticed that some people had been watching them, but it didn't matter. First of all, he had the hardest part behind him: saying that poem without messing it up and asking the one question he wanted to ask. Those few people who noticed the proposal weren't noticed by him. His eyes were on Nicole, nothing else mattered. He had taken her by surprise, that much he knew and the look on her face was worth all the nervousness he felt, until she replied. A happy smile came to Danny's face, as he got up from his knee and slowly slid the ring onto her finger, his heart still beating fast. But he was happy, the happiest man on this platform in that moment. And the luckiest that he found the woman he wanted to spend the rest of his life with much faster than he first thought he would. Of course he heard those few people around cheering, but he was still focused on Nicole, his fiancée as of now. As excited as he was about it, he kept that well in check. Only the look on his face gave that away. 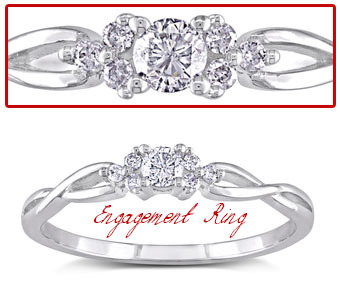 After he put the ring on her finger, he looked at it for a little moment, then into her eyes and leaned in slowly until their lips met for a sweet, loving kiss. One that still indicated how much he actually loved Nicole and how happy he was that she accepted his marriage proposal. Nicole watched Danny as he slipped the ring onto her finger, then wrapped her arms around Danny as he kissed her. It was clear that she was happy for this moment. I'm going to be a wife......and then a mother she said to herself. As she said that, an image of herself singing a baby to sleep came into her head, which made her smile. Danny was just relieved that he got the answer he was hoping for. He was as happy as can be about it. He let this moment sink in, while he kissed Nicole, eyes closed. He was going to get married! And this time he'd do it right, that was what he promised himself before he actually thought about a proposal again. A family... yes he would want a family with her. Children of their own to look after and watch growing up. He's always wanted that and now it actually was possible to realize that dream. The image of Nicole and Danny happily playing with their children came to mind, causing a soft smile to come to Danny's face, as he softly pulled away from Nicole. Nicole noticed the smile on Danny's face as she watched him. "We're getting married" she said to him, clearly happy as she said that to him. There was a smile on her face as well, but it was for a very good reason. She hadn't been this happy in a long time. Danny nodded slowly, letting that thought sink in. Right now, it was still hard to believe that this was really happening to him. He had found happiness once again, after being so disappointed and hurt before. True, he was hasitant when they first met, but he never was this sure about something as he was now. And he couldn't remember when he was this happy. It probably was a long time ago, if he ever was as happy as he was now, the way he felt about it now. "We are." he agreed, the truth about it finally settling in. "That makes me the luckiest guy on earth." "That it does" Nicole replied, the smile still on her face. "We have a lot of planning ahead of us." she added off the cuff. "But we can start that tomorrow." Nicole said to him, she just wanted to enjoy the moment tonight for now. Danny actually liked the sound of that. He didn't quite get to planning the wedding when he was with Anna, since they wanted to take their time. But now, he was actually eager to look into all of that stuff again and find a nice place to get married. Looking at Nicole, Danny actually couldn't wait to see her in her wedding dress. I wonder what kind of dress she'll pick. he thought, a smile on his face. "I like the sound of that." he replied. "Because tonight... I have different plans with you." "Oh you do?" Nicole asked while watching him. "And what does the cute bloke have planned for his Aussie lass?" she asked, a playful tone to her voice. Nicole hoped Danny would be up to having Irish elements to his wedding as Nicole was Irish to the core. Danny smiled a little, taking her hand in his. He had a table for them at the restaurant, so dinner was his plan for tonight. Anything after that would be played by ear. "Well, for now just dinner in the restaurant with the best view over the city." he told her. "And after that... we'll see." Danny added with a playful tone. Nicole nodded in reply when Danny said that to her. "Sounds ace" she said to him while walking over to the table with him. It was clear that Nicole was still giddy about what had just taken place. No one could blame her for feeling that way. One of the waitresses noticed her and smiled a little, she had seen the proposal and was happy for Nicole. Danny lead Nicole back into the tower and down to the floor the restaurant was on. He could tell that Nicole was happy about him proposing to her and the fact they were going to get married. He was, too and the smile tugged to his face was a tell. It was there, for everyone to see and he didn't even mind. He felt like the luckiest guy, knowing he'd spend the rest of his life with the most beautiful and wonderful woman he ever met. Once inside the restaurant, he lead Nicole to the table he got for them just a few days ago. It was near to a window and had just the same beautiful look over the city. Nicole looked at the view and smiled even more. "This is good as gold." she said to Danny before looking back to Danny as she stood there. "I love it" she added while looking at him, resting her hands on the chair that was in front of her as she said that to him. Danny smiled a little, obviously glad that she liked it here. He admired the view for a moment, before he pulled a chair out for Nicole and helped her in, like the gentleman he was. Always taking care of the lady first, before he would take care of himself. That was the way he had been taught. "I'm glad you like it." Danny said in a happy tone. Nicole nodded a bit as she sat down, thankful that Danny did that for her. "I don't just like it Danny" she said to him in reply while sitting there, putting her hands on the table at the same time. It was still sinking in for Nicole that she was going to marry Danny. Danny gave Nicole a bright smile in reply, letting the moment of him proposing to her and her saying yes replay in his mind. He was glad that he finally decided to just go ahead and do it. It felt right. And what more could he possibly ask for? Just a moment later the same waitress who watched the proposal attented to them. She had a friendly smile on her face, as she placed the menu on the table in front of them. "Welcome to Top of the World." the young woman said in a friendly tone. "And congratulations to the both of you. Couldn't help but notice the moment on the platform."